Dina Hannah started commuting to work about 7 years ago as part of a commuter challenge sponsored by UTA in which ARUP Laboratories encouraged its employees to participate. As an admittedly “overweight, out-of-shape, middle-aged, ex-marching band clarinet player”, Dina has transformed her life through cycling. 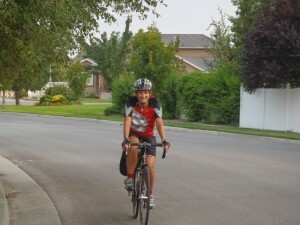 This year she took her commuting experience and entered RAAM (Race Across America) as part of a team of 4 women. They won their age group, finishing in just over 7 days. There were also very nice write ups in the Salt Lake Tribune and the Denver area, Rocky Mountain News prior to her RAAM experience. Cycling Utah: So how did the evolution of your cycling begin 7 years ago? Dina Hannah: I didn't even have a bike at that time…I went to the local bike shop and bought a $400 mountain bike and put slicks and a rack on it. I commuted on that bike for a couple of years and then “upgraded” to a Cross-bike…love that bike! I began commuting primarily for health (exercise, losing weight) and then I began to really enjoy the gas savings I was realizing! I began to get more involved in becoming “eco-friendly” because of my commuting and started making other such changes in my life as well. I also love the stress relief aspects…by the time you get home from work, there's not a lot bothering you anymore! C.U. : Tell me about your commute. What keeps you from commuting? What keeps you motivated? Dina on her way to work. Photo courtesy Dina Hannah. D.H.: I commute 15 miles each way and will commute when it's dark, but not when it's icy. I don't want to take chances with having an accident…I would prefer to ride another day! I have been soaked in the rain…it's not too bad until the next day if your shoes haven't dried out yet! I actually really enjoy riding in the dark…it's very calming to me. Plus…you can see when a car is coming up behind you! I commute because I love how I feel in the am when I get to work and it's a good way to get the time on the bike that I would otherwise have to fit in very early or very late after work. I find that I can't commute when I have something I have to carry that won't fit in my panniers, or if I have a very tight schedule with something after work. I also will not commute if there is a lightning storm…I've had several days where I hope to make it to the Trax before getting hit! Again…I will not commute at all costs, but would prefer to ride my bike to work than drive most days! My typical commute starts by the Jordan River just off Winchester and ends at Research Park. I weave my way through neighborhoods and lesser-traveled roads, with the exception of 900 E. I ride on 900 E from 5400 S to 2700 S. I feel very safe on my route…with the exception of Foothill and Sunnyside. I absolutely hate that intersection…whether coming to Research Park from 800 S or from Research Park back. For a commuter campus, that is not a very bike friendly part of town. I love riding through Murray and through the Sugar House areas above 900 E and 2700 S. The roads are wide and there are relatively slow speeds. C.U. : Do you utilize the bus or TRAX as part of your commute? D.H.: I always bring cash in case I have a mechanical or other problem and need alternate transportation. I have also had to call for rides on occasion when I find myself a bit far from a bus line. It's nice having a smartphone these days…I can easily look up bus routes and Trax times if necessary. I have used bus/Trax when there's been lightning, very high wind gusts, when I've destroyed tires/tubes and once when my cable broke. I always bring tools to fix as much as I can, but sometimes you just can't fix something. One time I had a flat and when pumping the tube after the patch, I accidentally ruined the stem by pulling off the top part of the presta valve. I was then at the mercy of the bus. After that…I tried to ride on roads that are on or very close to major bus routes. C.U. : What is the “Clean the Air” Challenge? Why did you participate? How did you win the contest? How are programs like the “clean air challenge important for bike commuters? For society in general? D.H.: I discovered the Clean the Air Challenge (cleartheairchallenge.org) at a bike fair held at the Gallivan center prior to the Cycle Salt Lake Century one year. The challenge was to reduce your carbon footprint by either carpooling, biking, walking, tele-commuting, “trip-chaining” (combining a trip to the store with picking up the kids for example)…just about anything that would result in taking a car off the road for a period of time. Each participant logs in how they reduced their gas-guzzling trips that day and then your carbon footprint savings is automatically calculated on the website. You can pick the goals for which you want to participate (there is a gold, silver and bronze level of participation) and then if you meet or exceed those goals then you get put in a drawing to win prizes. I thought it sounded like a really cool thing to get my staff involved with. I came back with the challenge for my staff and soon there were many folks at ARUP who wanted to participate in the Challenge. The first year was more of a grass-roots awareness of the Challenge. The second year, ARUP's participation grew. This year ARUP is a sponsor of the Challenge! The second year I participated in the Challenge, I won the Gold Award for “most consistent” commuter. I commuted and/or trip chained and/or carpooled every day of the challenge. I think Clear The Air is very important. If it gets just a few thinking they don’t have to drive to get where they are going, it will make a difference. Not only will there be cleaner air, but if folks commute by bike, they will be healthier both physically and mentally. This can only positively affect society – less stress on resources, fewer cars on the road, and great for our local bike shops economically! C.U. : How could the Clear the Air Challenge be improved? Should it be expanded? Are there alternative promotions that you think would be better for promoting bikes? D.H.: I think the Clear the Air Challenge is gaining momentum however with the raise in Trax/Frontrunner fares, some may not feel it's worth it to spend an hour or more getting to and from work for around the same cost they could drive. It would be nice to promote more bike participation – as I talk to people, they seem like they would like to bike, but they are scared about riding on the roads with cars. It would be great if there were a community forum (city or county sponsored) where commuters could post their routes, their experiences, tips for watching out for cars, and even what kind of equipment they use (lights, clothing etc) to keep them safe. I think by sharing these things more folks might be interested in venturing out. An alternative promotion could also be directed at a company that achieves a certain level of participation…maybe they could get funding for a couple of bike lockers or something that would benefit more of their employees as they ride. C.U. : Does your employer help with bike commuting in any way? Is it at least supportive of your efforts? Did you receive any feedback or “atta-girl” benefits for winning the Challenge? D.H.: ARUP Laboratories is very supportive when it comes to bike commuting. They have invested in bike lockers and have shower facilities or close access to shower facilities in nearly all their buildings. ARUP is committed to employee wellness and actively supports challenges that get people moving. ARUP has always been supportive of me in my commuting activities. Often times I will be asked if I can attend an early morning meeting because senior management doesn't want to negatively impact my commute. I usually just get up earlier and ride in the dark, but it's nice to know there's that concern. C.U. : You have been commuting for 7 years, but a jump into RAAM is quite the transition. How did that come about? D.H.: The very first cycling book I bought after I started commuting by bike was “The Complete Book of Long Distance Cycling”. There is a chapter about RAAM in the book and I found myself reading those pages over and over. Perhaps I decided on some level back then that I was going to race RAAM someday. I was planning to race a 508-mile race in the fall of 2012 when just last November I received an email from a friend asking me if I might be interested in joining a team of three other women in racing RAAM in June 2012. I immediately jumped at the chance! I had been planning on the 508-mile race as a RAAM qualifier. I decided; why do that when you can do RAAM itself! After having finished RAAM, I am now qualified for a solo RAAM. C.U. : So how was the RAAM experience? Exhilarating or Exhausting? D.H.: RAAM was an amazing experience, from start to finish. Despite the record high temperatures through the deserts, the 60 mph winds through Kansas and the torrential rain in West Virginia, there was never a moment that was not “worth it”. Yes, I was tired from the lack of sleep, but the excitement of racing and accomplishing something so huge offset that. We really have a beautiful country and to see it up close at an average of 18.5 mph is a unique and very rewarding experience. C.U. Did your bike commuting skills help you with RAAM? D.H.: Absolutely! Commuting by bike over the past several years has helped me feel comfortable in traffic and in all kinds of weather and road conditions. When you commute by bike, you have to be willing to ride in heat, cold, wind, rain and yes…even nice weather! You learn how to dress and feel comfortable whenever these conditions arise. Also, commuting in city traffic day after day teaches you to anticipate driver's actions and to know instinctively where the most dangerous times/places on the road are. For example, you have to be particularly careful when passing shopping centers or even convenience stores between 5 and 6:30 pm – drivers have already “checked out” for the day and want to get home. They probably won't be watching as carefully for you, may be on the phone with the kids and are more likely to pull into you as they turn into or out of one of these businesses. This behavior is consistent across America and I felt much more comfortable passing through towns that I didn't know, because I still knew where the danger zones would most likely be. C.U. : Will you be doing another RAAM? D.H.: Absolutely! I plan to race RAAM in 2014 as part of a 2-woman team. I have already been talking to one potential racer and if she agrees, we will ROCK this race! C.U. : How will you challenge yourself in the future? D.H.: I am planning on racing more of the long distance, endurance races. I am planning on racing RAW (Race Across the West) next June and will likely look at racing some 500-mile races, provided I can get the funding and crew support together for these events! C.U. : Will your bike commute seem easy after the RAAM experience? D.H.: They are two completely different styles of riding. I enjoy both and I do suspect that occasionally my bike commute might seem harder than RAAM because when really bad weather (rain, lightning) hits I might be more tempted to seek a ride home. That mental struggle sometimes makes the commute a bit harder. With RAAM there was no choice…just have to push through! C.U. : Anything else you would like to say? D.H.: I began bike commuting in my early 40s and it has literally changed my life. I have lost 100 pounds and have transformed into a competitive athlete. My health has improved, both physically and mentally. This all began by taking the challenge to get on a bike a ride to work for one week. I would like everyone to know that it's never too late. You can start riding or doing any activity and it can change your life just as dramatically. You don't have to Race Across America to see such a positive change…even riding your first 10 mile stretch is rewarding and, when repeated on a regular basis, will bring about great results. You CAN do anything you put your mind to! C.U. : Congratulations on commuting, being a gold medal winner in The Clear the Air Challenge and for finishing and winning in the RAAM. Most importantly, congratulations on an amazing life turn around. You are an inspiration to a lot of people. (Dina is also a 2-time age group winner of the Logan to Jackson race (LotoJa)).